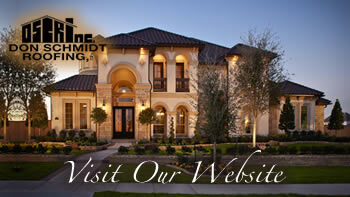 Home » Don Schmidt Roofing Blog » A Few Tips For Proper Care Of Your Roof. A little roof care can go a long way for extending the life of your roofing system and keeping it functioning efficiently and effectively. While an in-depth inspection should be performed annually by a roofing professional, homeowners can still help prevent costly repairs in the long run by following these roof care tips. Extreme caution should always be exercised when performing any roof care tasks. Walking on a roof is dangerous and homeowners should only access the roof from a flat or nearly flat roof plane. If you cannot safely access your roof, it’s better to call in professionals who are equipped to deal with steel-sloped roofs. Clean & flush gutters regularly. Remove debris, leaves, sticks, and anything else that has made its way into your gutter system. Clean gutters mean water won’t overflow back into your roof system, leaving it susceptible to water damage. Keep tree limbs and bushes trimmed so they are not touching your roofing system. Remember to trim them away from your structure so they do not fall on the house. Remove any branches, leaves, or debris that that have settled on your roof after a storm. Moss and algae growing on your roof can trap moisture which will compromise the longevity of your system. If you notice algae, moss, or mildew forming on your roof, call in roofing professionals who can properly remove the growth with a chlorine solution. When installing equipment on the roof such as a satellite dish, vents, or a chimney, inspect the work to ensure that the roof seal is maintained and that any flashing is properly installed. Visit your attic occasionally to check for signs of moisture which can include water stains or wood rot. Call your roofing specialist if you see any of the felt underlayment or notice that the granular topcoat has become worn or deteriorated. Visually inspect the eaves and fascia of your roof for signs of water leaks or rot. Make sure that downspouts from upper floors do not empty onto the roof surface. Downspouts should connect directly to gutters and run down to the ground to ensure that water is directed away from the roof to prevent wear & tear of your roofing materials. If you have any questions about at-home roof care or would like to speak with a roofing expert, call us first at (407) 892-9884 or contact us online at www.DonSchmidtRoofing.com. We are a local family owned business serving central Florida since 1988 and an Osceola county resident since 1959. Put your roofing project into the hands of a contractor you can trust.